From left: Provost Daniel Diermeier, students Asya Akca and Shae Omonijo, sculptor Preston Jackson and Vice Provost Melissa Gilliam take part in the unveiling ceremony. Photo by Nancy Wong. 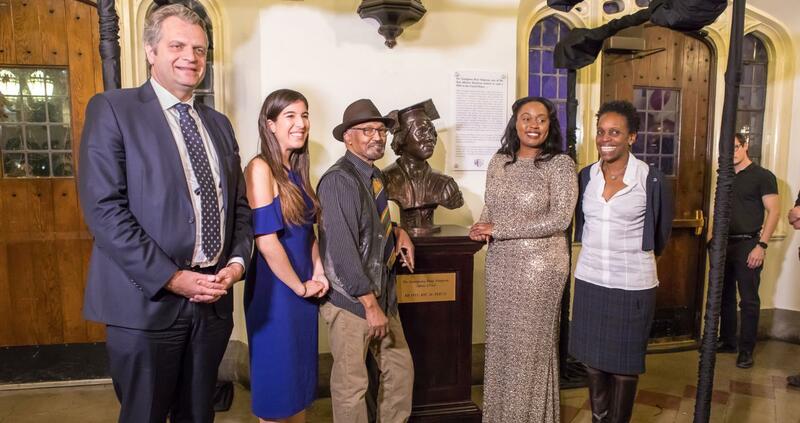 Preston Jackson, famed sculptor and professor emeritus at the School, was seen across town at the University of Chicago unveiling of a bust he completed. Its subject: first Black female PhD recepient of the university. Georgiana Rose Simpson, who recieved her degree in German philology from the University of Chicago in 1921, was one of the first Black women in history to do so. She is honored through the Monumenal Women Project, a student-led organization designed to empower women through acknowledging underrepresented historical figures from marginalized groups on campus. With support from various funding sources inside and outside the university, its founders raised close to $50,000 for the completion of the bust. Jackson was commissioned to create it. In addition to being on hand for the unveiling, Jackson also spoke at the event.